Complex Disease Detector from Sweden, ColorADD (Portugal), The FreeBird Club (Ireland)) and Walk With Path (United Kingdom) are the winners of the Social Innovation Tournament 2017 which took place on 21 September in Riga, Latvia. Complex Disease Detector won the First Prize in the general category and ColorADD won the Second Prize. The FreeBird Club and Walk With Path shared the First Prize in the Special Category on ageing. Complex Disease Detector is an accurate, non-invasive and affordable technology for screening and early diagnosis of heart disease. They also won a voucher to receive subsequent advice from EY Transaction Advisory Services in Brussels. ColorADD is a unique, universal, inclusive and non-discriminative language that allows the colour-blind to identify colours, with a wide infinite spectrum of use in companies/entities whenever colour is a factor of identification, orientation or choice. The FreeBird Club is a travel-based social network for older adults. Operating as a peer-to-peer social travel and home-stay club, it offers a whole new way of travelling for older adults, a potential new source of income for hosts, and a fun and accessible way to meet new people and enjoy companionship in later life. Walk With Path is a healthcare company aiming to improve mobility and reduce the risk of falls for a range of individuals, including the elderly and people with chronic diseases. In addition, three projects – GIVMED (Greece), More than one Perspective (Former refugeeswork.at) (Austria) and ULTRASPECIALISTI (Italy) – won a voucher to receive subsequent mentoring services to help take the project forward. Discovering hands® (Germany) and MagikMe (Hungary) will benefit from the INSEAD Social Entrepreneurship programme in the framework of a partnership between the Institute and INSEAD Business School started in 2016. AdoptGrandParents (Spain) and Arborea (UK) were selected for an EIB Institute financed residency at the IRIS Social Incubator (Incubadora Regional de Inovacao Social) for up to two members of their teams and for a period of between three and six months. IRIS is a Regional Social Innovation Incubator fostering regional development through social innovation, recently launched by the EIB Institute and PortusPark. 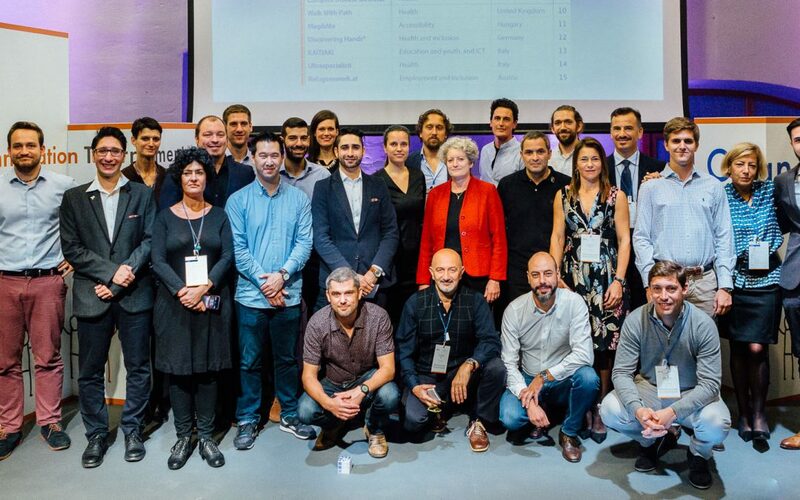 Fifteen finalists from ten countries had initially been selected for the Tournament from 308 proposals submitted by applicants from 31 countries. Click here for the press release and here for the booklet.